Bike Attorney Ft. Lauderdale | Welcome to Adam Franzen. P.A. (3)(d) A bicycle rider or passenger who is under 16 years of age must wear a bicycle helmet that is properly fitted and is fastened securely upon the passenger’s head by a strap and that meets the federal safety standard for bicycle helmets, final rule, 16 C.F.R. part 1203. A helmet purchased before October 1, 2012, which meets the standards of the American National Standards Institute (ANSI Z 90.4 Bicycle Helmet Standards), the standards of the Snell Memorial Foundation (1984 Standard for Protective Headgear for Use in Bicycling), or any other nationally recognized standards for bicycle helmets adopted by the department may continue to be worn by a bicycle rider or passenger until January 1, 2016. As used in this subsection, the term “passenger” includes a child who is riding in a trailer or semitrailer attached to a bicycle. (e) Law enforcement officers and school crossing guards may issue a bicycle safety brochure and a verbal warning to a bicycle rider or passenger who violates this subsection. A bicycle rider or passenger who violates this subsection may be issued a citation by a law enforcement officer and assessed a fine for a pedestrian violation, as provided in s. 318.18. The court shall dismiss the charge against a bicycle rider or passenger for a first violation of paragraph (d) upon proof of purchase of a bicycle helmet that complies with this subsection. One of the most common types of injuries resulting from a bicycle accident is a head injury. This is because, often, cyclists are thrown over their handlebars and have little control over the way they land. Of course, bicycle riders can help prevent head injuries by wearing helmets. Head injuries can come in the form of bumps, scrapes, gashes, or even fractures of the skull, leading to a greater probability of a resulting brain injury. condition of the roadway or trail (potholes, construction sites, etc.). Because of the nature of exposure when we ride bikes, spinal cord injuries can result when a bicycle crash victim lands on his or her back, neck, or head with the proper amount of force. This can lead to vertebrae fractures or even paralysis. Common facial injuries resulting from bike accidents include the loss or damage of an eye, broken jaw, broken nose, chipped teeth, and extreme scarring that can last a lifetime depending on the severity. The legs, arms, shoulder, back, neck, hip, and almost any other bone in the body could be at risk of suffering a fracture. Multiple bone breaks are not uncommon and could lead to extensive treatment, rehab, and recovery. With no barrier or protection between you and a motorist or an object such as a tree, street, or building, the chance of suffering fatal injuries is possible. When someone you love has been the victim of wrongful death such as this, The Franzen Firm may be able to help. 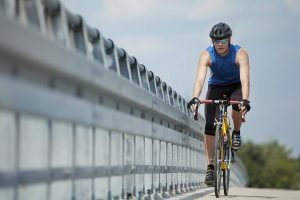 Bike injury attorney Adam Franzen knows Florida bicycle laws. If you have sustained injuries in a bicycle accident that was not your fault, contact The Franzen Firm today. There are many stipulations in the state of Florida regarding bicycle accidents. Adam Franzen knows the laws and can help you after a bicycle accident. Contact him immediately after an accident at (954) 462-5790. You can also visit his website to learn more about how he can help you with your bicycle and other personal injury cases. This entry was posted on Friday, September 23rd, 2016 at 4:01 am	and is filed under Blog. You can follow any responses to this entry through the RSS 2.0 feed. Both comments and pings are currently closed. © 2016 Law Offices of Adam Franzen, bicycle accident attorney, All rights reserved.